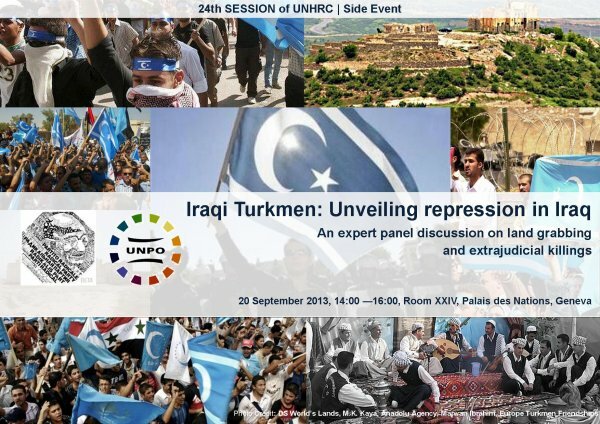 On behalf of the Unrepresented Nations and Peoples Organization (UNPO) and the Nonviolent Radical Party, you are cordially invited to attend the parallel event “Iraqi Turkmen: Unveiling Repression in Iraq”, which will take place in Room XXIV at Palais des Nations, Geneva, on the 20th of September 2013, 14.00-16.00. This event will serve as a platform for raising awareness about the current human rights situation with respect to the Iraqi Turkmen. There will be a specific focus on Land Grabbing and Extrajudicial Killings. Historically, land grabbing was one of the major assimilationist tools used by the Ba’ath Regime in Iraq and the consequences of the land grabs can still be felt today. This policy of assimilation followed by massacres directed at the Turkmen community has led to the decay of Turkmen civil society; this event is designed to inform the public of the issues concerning land grabbing and extrajudicial killings faced by the Iraqi Turkmen. This event will also provide a platform for discussion on the future of, and the injustices suffered by the Iraqi Turkmen. Ms. Sundus Abbas – Iraq Turkmen Front Representative to the United Kingdom. More information on the event will be available soon on our website www.unpo.org and on our Facebook page. REGISTRATION FOR THIS EVENT IS REQUIRED THE DEADLINE FOR REGISTRATION IS TUESDAY 17 SEPTEMBER 2013 AT MIDNIGHT (GMT +01:00).